Sasha’s litter was expected on or around the 27 of February and we weren’t anticipating a big litter based on her scan which showed 2 pups and she didn’t look particularly large. 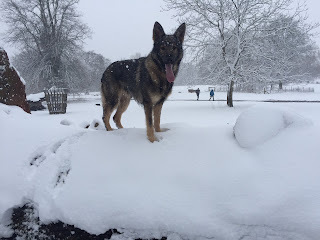 Worryingly Sasha started showing signs her pups could be arriving as early as Tuesday 21 February then late on Thursday night it was obvious to me that her whelping was very imminent. I stayed with her during the night and just after 5am on Friday 23 of February her first puppy duly arrived. Within 3 hours she had 4 healthy puppies and I thought that was it. Sadly about an hour later a very large male puppy partially emerged and it was pretty obvious that the puppy was stuck and despite efforts to help deliver and resuscitate the puppy we lost him. As upsetting as this was it is fairly common for a puppy to be born dead and there was no time to grieve because shortly after that and much to my surprise she then delivered 2 more pups. The first of these last two puppies also became stuck but between Sasha and I we managed to get him out and get him going. Rightly or wrongly on the first day I do not tend to handle the pups or interfere unless I have to because I do not want to cause mum any more stress than is necessary. It was the following day I confirmed that there were definitely 4 boys and 2 girls. Once all of the pups were born and things had settled down I put in place the wooden pig rails which prevent mum inadvertently lying on one of her pups. Sasha has her own Sofa next to the whelping box which allows her to take a break from the pups if she needs to. This is particularly useful after a couple of weeks when the pups become larger and more aggressive in their feeding. The temperature outside the room was as low as -4 degrees and so I used a heat lamp to make sure the pups maintained a consistent temperature because puppies are unable to regulate their own body temperature for several weeks. Mum is fed a high grade puppy food with mince beef and raw chicken wings to help her maintain her milk quality but she is always grateful for a bit of my lunch. Sasha was a fantastic mum to her first litter the D litter which consisted of 9 pups but she is even more relaxed and chilled with this litter. Whether this is because she only has 6 pups this time or because it is her second litter and she is much more confident I’m not sure. There is no doubt 6 is a perfect number because all the pups have easy access to a teat without the constant battle that takes place with a larger litter. There is one pup we have named Elsie who is always sleeping between Mum’s front legs. The smallest pup in the litter is a little boy we have named Eddie. I have been giving him individual feeds on mum because he was constantly getting knocked of mum’s teats by the others. It has paid off as he is now putting on good weight. This picture 6 days in says it all really, a very contented mum and pups. Because they are all so alike I placed collars on the pups at 7 days to help me monitor their behaviour and weights. I have named the pups and allocated the collars as follows. 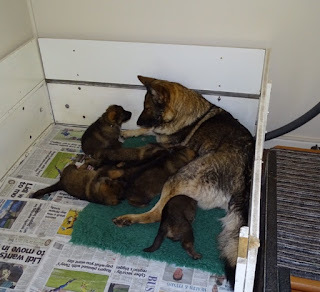 I have included a few videos to show how relaxed and content both Sasha and the litter are. 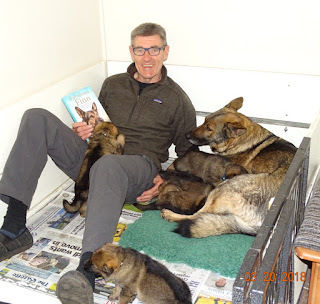 I have also removed the pig rails because now the pups are 10 days old they are much larger and stronger they are now able to let mum know if she is lying on them by accident. Sasha is back to getting her regular walks at Killerton and playing in the garden to keep her mind and body fit. She started sitting by my dog van hoping to go on our adventures at Killerton as early as day 3 after the pups were born. I am always careful where we go and I am well aware that we don’t want any diseases or infections being brought back to the pups. I believe a female is not a machine to be bred from with little or no thought given to her needs. Those needs are a private environment where she is comfortable and with people she knows and trusts caring for her. She should have the best food, regular exercise and toilet breaks, fresh water always on hand, a spotlessly clean environment and the freedom to come and go to her pups and certainly not being taken away from them as early as possible for convenience. In the garden I have to keep my eye on Sasha because she likes nothing more than going up to a muddy den hidden in the bushes and returns with all of her under carriage completely dripping in mud requiring a complete bath. Here are a few more photos of Sasha and the pups. Today is day 10 and the pups are now opening their eyes and things start to become more interesting. I will be doing a weekly blog showing their progress every week. Here is a video of Sasha and her pups taken this morning. In my next blog I will tell you more about the father of the pups Xato. As I finish the blog on my laptop Sasha is lying at my feet completely at ease with life but always ready to respond if her pups call her from the room next door. 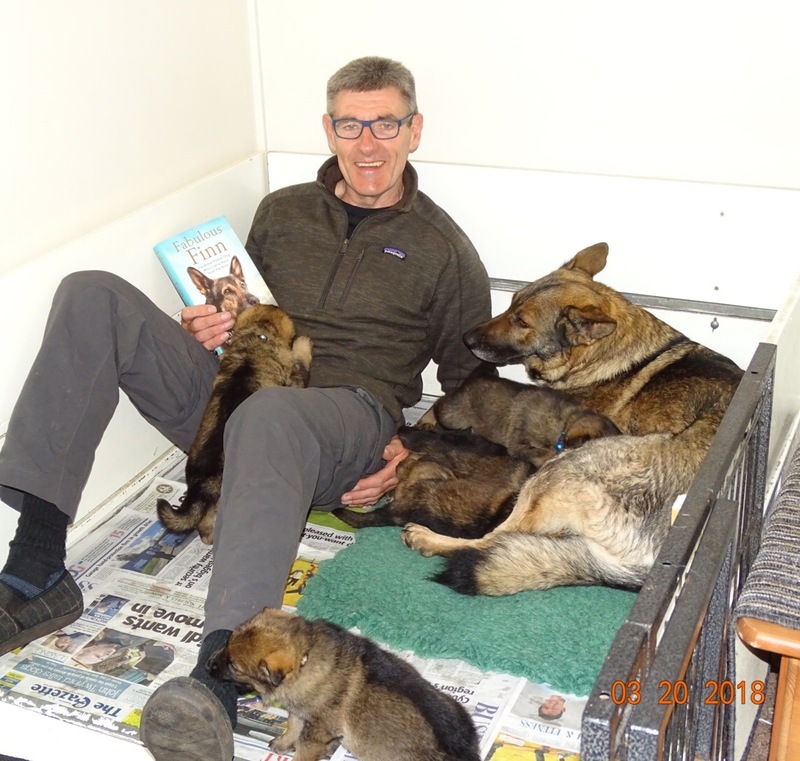 Due to Sasha’s pups being only 2 days old my wife Di had to look after them while I went to supervise one of my favourite training days the visit to Saundercroft farm near Broadclyst. It was a day of mixed emotions because normally when we arrive we are greeted by German shepherd Holly who lives on the farm but sadly Holly had recently passed away. Here is Holly pictured on the far right in happier times with her owner Jean who allows us to use her farm on our farm visit in April 2017. 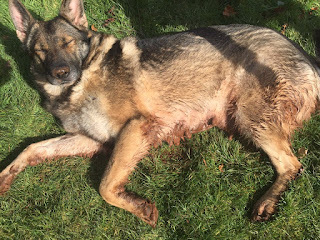 The farm visit is very important for potential Police dogs because they will be required on occasions to search farm land for outstanding criminals or vulnerable missing persons. They need to be able to work amongst livestock. 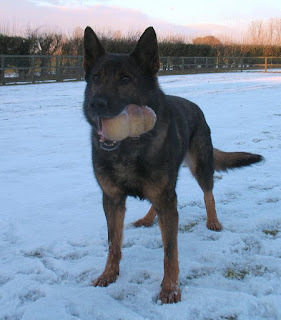 Some of the dogs can be a bit reactive on first seeing some of the animals but we keep the dogs back until they get their confidence and eventually get bored. That is the time then to introduce them to the animals when they are no longer in a state of heightened excitement. Here are a few of the dogs meeting the sheep. Next it was time to meet the calves. Next Andi and young Will were waiting to introduce the dogs to the bigger horses. Last but not least were the chickens. The local fox had killed quite a few recently and naturally they were a bit nervous of the dogs. It was a sad day for Terri and Mark who have been puppy walking Quini. Terri is going back to work and so can no longer look after Quini and was handing her over to Mary at the conclusion of the visit. So another excellent visit and thanks once again to Jean, Andi and young Will for their help and allowing us to visit. From Ella, Sasha, and me bye for now.